This is a new favorite soup! Rich and flavorful, and worthy of serving to guests. Or just you, curled up with a good book! 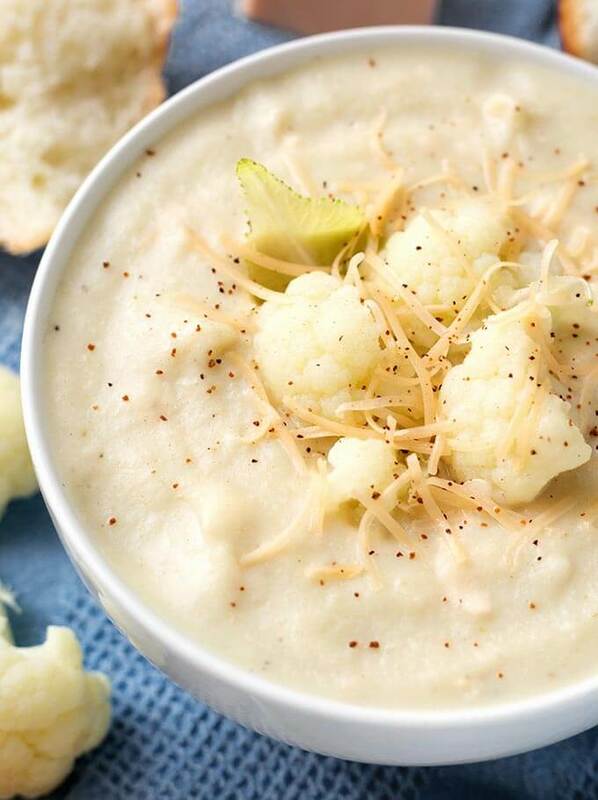 Instant Pot Smoky Creamy Cauliflower Soup is a mouthful to say, and a tasty mouthful to eat! I just want to know where September went! We hear it all the time, that time goes by so quickly, but isn’t it the truth?! So into Soup Season we go! I’ve made this Instant Pot Smoky Creamy Cauliflower Soup on the stove top and the guys love it! It’s not easy to convince them to eat vegetarian meals. I knew when I came up with this recipe that there would have to be a pressure cooker version of it. So I made it exactly the same way as my stove top Smoky Creamy Cauliflower Soup, and I didn’t have to adjust it too much. Most obvious is the cooking method. Cauliflower is a fast cooking veggie, and in the Instant Pot it only takes a few minutes. You could easily make this on a weeknight. The most time consuming part is chopping the veggies! It cooks in almost the same time as the stove top version, if you include the time for the pot to get to pressure. Maybe it’s a few minutes faster. I really like cooking this soup in my Instant Pot! I used to make this vegetarian (I used vegetable broth). You can also make this with chicken broth, which is also really good, and what I used for this Instant Pot version. You could also just use water, and just adjust your seasoning at the end. The star of this soup is smoked cheese! I have made it with smoked Gouda, and smoked cheddar. Both are great, so I would just get what you love, or what’s on sale. It’s a little spendy, but it is sold in small blocks, and it’s totally worth it for a big pot of soup! Even if you didn’t add the cheese you would still have a delicious pot of cauliflower soup, so you can’t go wrong! 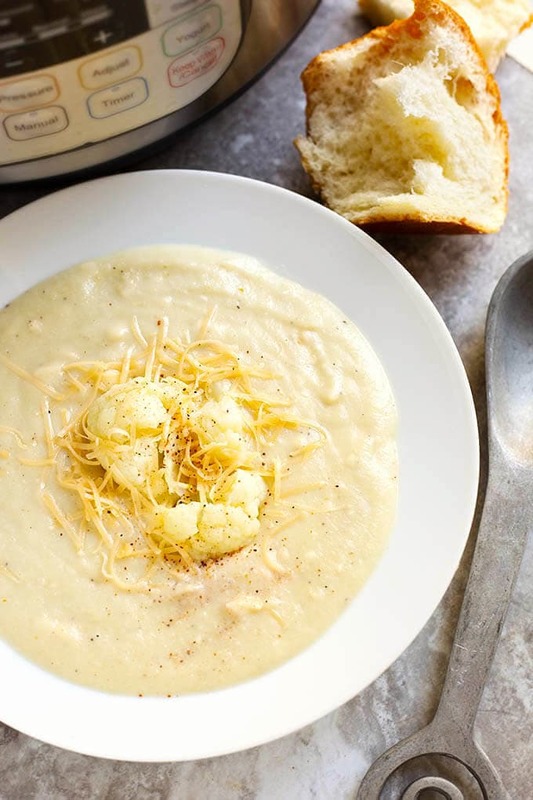 Enjoy making and eating this Instant Pot Smoky Creamy Cauliflower Soup! 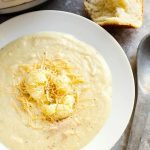 Instant Pot Smoky Creamy Cauliflower Soup is rich and creamy with a subtle smoky flavor that is wonderful! Perfect with some crusty bread on a crisp Fall day! Set Instant Pot to Sauté (or browning) mode. When the pot gets hot, add the olive oil and butter. Add the onion and celery and sauté until vegetables start to become translucent. Sprinkle the flour on the vegetables and stir (they will become thick from the paste that is formed). Cook for just about 20 seconds to get the raw flavor out of the flour. Place the lid on the Instant Pot and set the steam release knob to the Sealing position. Press the Manual (or Pressure Cook) button and then the + or - button to choose 6 minutes. When cooking cycle ends, let the pot naturally release the pressure for 10 minutes. Then manually release the remaining pressure, gradually at first. Use an immersion blender (or transfer to a blender or food processor in batches, very carefully!) to puree the soup. Add the shredded smoked cheese to the soup and stir until melted. Stir in the half and half. Taste soup and adjust salt if needed. This sounds wonderful! Do you think I could use frozen cauliflower? Would you change any timing? We like the chunks of vegetables, so probably wouldn’t blend it. Hi Karen! Yes, you can use frozen cauliflower. It will thaw very quickly once you add it to the pot with the other hot ingredients. I would not change the time. This is so yummmy! I’m having a bowl for breakfast as I write this. Hi Jennifer! I like your breakfast choices! I’m also a leftovers for breakfast kind of girl! So glad you like the soup! Thanks for your review! Very good didn’t use the cheese since i am lactose intolerant but added Jalapeno pepper instead and no nutmeg and it was very tasty. Thank you for sharing. Hi Nancie, I’m glad you liked it! That was a good substitution!